Citizens are becoming increasingly aware of the climate impact of our food choices. According to the EPA, an estimated 1/3 of all human caused greenhouse gas emissions come from our agricultural systems; from the forests cleared to grow crops, to the production of fossil fuel-based pesticides and fertilizers, to the processing, packaging and transportation of our food. Livestock production also has a role to play in global warming, with, according to the UN, an estimated 18% of all greenhouse gases coming from animal agriculture. According to a recent report from the WorldWatch Institute, this figure may be as high as 51%. In New York, politicians have started to embrace these issues. Manhattan Borough President Scott Stringer has come forward with the NYC Food Pledge and Charter, based on ten principles for a sustainable food system. While unlike FoodWorks New York, City Council speaker Christine Quinn’s initiative, Stringer’s Charter does note the environmental impacts of livestock production, his initiative stops short at calling for reduced levels of meat and dairy consumption. 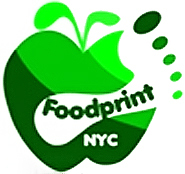 Brighter Green is supporting ongoing efforts to see passage of the Foodprint NYC Resolution, a framework that makes explicit these connections. The Resolution calls for increased access to local fruits and vegetables for all New Yorkers, especially those in low-income communities and in city-run institutions. Why A Climate Foodprint Resolution for NYC? How Can You Reduce NYC’s Climate “Foodprint”?